The newly established University of Health and Allied Science (UHAS) in Volta region have begun admitting students for the 2012/2013 academic year. 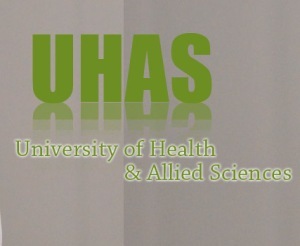 Checks at the university’s official website (www.uhas.edu.gh)revealed the publication of the names of forty (40) students admitted into the Schools of Medicine, Nursing and Public health. The forty students according to available information, are the first batch of the two hundred (200) students expected to commence academic work at the Ho campus of the university in October. Out of the forty students, a total of 26 students have been admitted into the school of medicine with 17 of them expected to study BSc Physician Assistantship (Clinical option) and the rest 9 students studying BSc Physician Assistantship (Anesthesia option). Six students out of the forty has also been admitted into the School of Nursing to study BSc Nursing while the rest nine students have been admitted to study Bachelor in Public Health (BPH)-Disease Control option under the school of Public health. A Total of seven females have been admitted so far, out of which three have been admitted into the school of nursing, two in the school of medicine and the other two under the school of public health. At a meeting held last August, between the university council and the Parliamentary Select Committee on Education, Professor Fred Binka, Vice Chancellor of the university disclosed that a total of 637 prospective students have applied to the university and out of which 200 students would be given admissions to study in the Schools of Medicine, Basic and Biomedical Sciences, Allied and Health Sciences, Public Health and the School of Nursing and Midwifery. Parliament in December 2011 passed two bills for the establishment of the University of Health and Allied Sciences and the University of Energy and Natural Resources in the Volta and Brong Ahafo regions respectively, in fulfillment of a campaign promise made by the late president John Mills during the 2008 elections.